Like every other Brentford fan I am waiting impatiently for something to happen – for the white puff of smoke that signifies that a decision has been made. Will there be an announcement regarding the identity of our new Head Coach? If so will it come today/tomorrow/soon/next year – please delete where applicable. I am more than happy to wait until we are able to make the right decision and then get the deal over the line given that we are in safe hands at the moment under Lee Carsley, even though we are all aware – and he has made it abundantly clear – that he does not want the job and is keen to return to his development coaching responsibilities as soon as possible. Today also sees the closing of the Loan Transfer Window at 5 pm. Will we make a late signing that will take us all by surprise? Can we make do with Lasse Vibe and The Hof as our sole strikers until the return of Marco Djuricin? Is that taking an enormous risk given the number of fixtures coming up next month and over the holiday period? What happens if one of them suffers injury too? Will we have to rely upon the Development Squad to fill the gap? I was going to write yet another article covering all of the above and speculating on what might be happening behind the scenes. Instead I am going to save you the bother of reading my normal guff and I will wait a little while until maybe things appear a little bit clearer on both fronts. I will then look at the depth of the squad and discuss how well we are set up to deal with all the challenges that lie ahead. So today I am going to make barefaced commercial appeal to you all. If you like and enjoy what I write and you haven’t yet bought or even considered buying my book Ahead Of The Game, please can you at least think about doing so? It covers everything that happened last season – and what an incredible season it was – as well as what else could and maybe should have taken place too! 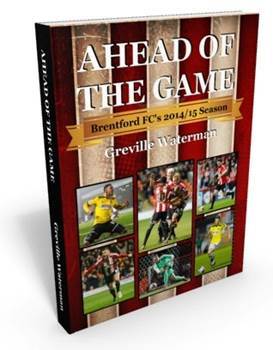 There are some great photos and articles on Brentford matches, players and managers from the present and past, lots of comment, humour and nostalgia as well as guest articles from the likes of Billy Reeves and Richard Lee. Hopefully an enticing prospect for all Bees supporters! More importantly I would like to thank everybody who has taken the time and trouble to buy it and I really hope that you have enjoyed reading it, either through inhaling it in one go, or reading it in bite sized chunks. The choice is yours! The reviews on Amazon have all been excellent and sales have also gone pretty well given its specialised appeal, with over 500 copies sold to date and I really hope that we can increase that figure substantially over Christmas given that the book would surely make an ideal present for any Bees supporter. Please can you also let me know if you have any comments on either the book or the blog as I would welcome any suggestions for future articles – or also publish anything that I am sent by any of you. As you are aware I have been writing regularly this season and there has been no shortage of material given what has been happening – good and bad, both on and off the pitch. I would very much like to publish another book next Summer covering all the happenings of this season but to be frank, in order to make that happen I have to demonstrate the commercial viability of Ahead Of The Game, and that means that sales have to increase over the Christmas period. I really need your help and I hope that some of you will be able to do so. As I have said, I am so grateful to everyone who has already bought the book and hope that others might take a look at it either on Amazon or from the BFC Superstore, as it is available in both places.